We have been doing grasshopper tennis with Big John for the past 3 weeks. Look at our cool learning. Can you spot us doing the racetrack or swinging the racquet like an 'elephants trunk'? We have been having lots of fun at Grasshopper tennis! Today we were learning about potential and kinetic energy. Potential energy is stored energy and kinetic energy is moving energy. Here we are on the playground showing potential and kinetic energy. In the Bright Bugs we are learning to write lots of fast words. We are using the word wall and the alphabet cards to help us. If we KNOW some 'fast words' without looking then we quickly write these down too. Look at our wonderful word power on the whiteboards today. We did this independently while Nicole was teaching reading groups. Didn't we show great integrity as well - doing this all by ourselves when Nicole wasn't watching! We have been learning about potential and kinetic energy in our 'Hot Science'. Watch this cool little slideshow and song to help you remember! Super soccer playing Luca! Wow - What a star! How amazing being 'Player of the Day' last Saturday. What a cool trophy you got to look after for the week. 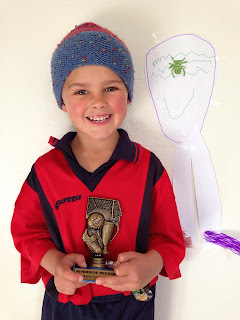 Thanks for sharing your super soccer achievement with us. Keep up the fantastic playing and doing your best out there on the field! We have been learning about temperature and we tried out a little investigation. I wonder if the Bright Bugs, the Busy Bees and Tohora can try this with you at home? Tino pai rawa Toby! Wow - what a fabulous effort getting player of the day at rugby on Saturday. I know you love playing rugby and you and Jaxon are in the same team which is awesome! Kingston is playing rugby too but for a different club. We are all very proud of you. Thanks for sharing your 'Player of the Day' medal with us. Keep up the super rugby playing! Look at our amazing cross country race. We were soooo fast! We are getting better and better each week with our poem pictures as we learn to draw shapes and then colour inside them. We are making sure we draw pictures that match the poem. Super effort bright Bugs. Keep striving for excellence!